Don’t you just love lighthouses? I do. It’s easy to imagine them lighting the way in a storm. And then there's the solitude of the lighthouse keeper’s life. That would probably last about a day for me! 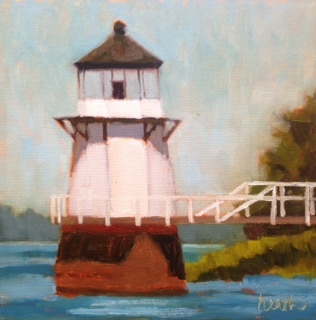 Lighthouses can also be fun to paint. They show different faces as the sun moves across the sky and the tide ebbs and flows. When we’re out on our boat, I always have the camera ready when a lighthouse comes into view. A few years ago my niece and I took a road trip with a goal of visiting as many lighthouses as we could. This little gem, on the Kennebec River, just south of Bath, Maine, was one of our favorites. It was commissioned in 1989, fifteen years after the founding of Bath Ironworks, just upstream. It’s not much taller than a person, and is just exquisite. You can walk out and around it, over the water It’s easy to get to by road, and the lovely people who own the property will likely let you park, but please ask first. Or, you can see it from one of the tour boats that operate out of Boothbay Harbor, along with several other lighthouses. It's a great boat ride. This painting was done from of several photos I took as we went by on our boat a couple of years ago. Here’s some more information about the lighthouse, and about the boat tours. And by the way, I painted this one mostly upside down. More about that in a future post.